I love to read. Like, really love to read 😊 I find that when I'm reading a good book, all I want to do is sit and devour it page after page after page. It happened a couple of weeks ago as I was reading Brandon Sanderson's Oathbringer, which Aiden gave me for Christmas. Once I hit about the mid-point of the book I accomplished practically nothing for a few days because I spent every spare moment reading. I love when a book is that good! What's not good is when I'm reading a book that good and someone starts talking to me. It takes a few seconds for me to even be aware that they're talking to me, and then it takes a little longer for me to drag myself out of the fictional world enough to be able to focus on what they're saying to me. Usually I have to get them to start over again because I completely missed the beginning of what they said. Their words were going into my ears, but my brain was too busy elsewhere to process what the words meant. though hearing, they do not hear or understand.'" Jesus had just told the people the parable of the sower (more on that probably next week) and the disciples wanted to know why He didn't just teach plain and simple lessons. Why bother hiding the lessons in stories? It's a valid question, right? If you want the people to understand, isn't it better to just tell them straight out? Jesus says that the people who are truly interested in what He has to say will focus on His words. They will not only hear the words, but they will also listen to them. The difference is like someone talking to me while I'm reading and someone talking to me while I'm actually paying attention to them. Those who hear Jesus' words but who are busy thinking about how so-and-so needs to hear what He's saying, or about what they need to do tomorrow, or what needs to be done at work, or anything else that isn't what He's saying, they are not truly listening. They're hearing, but not listening and therefore not understanding. They'll never see how what He said could be applied to their lives. They'll never take His words and change their lives with it. But those who hear His words and focus on them, who mull the story over and try to figure out what Jesus means? They're the ones who will gain knowledge from the story. They're the ones who will take that teaching, apply it to their lives and change because of it. Of course, today we can't sit on the mountainside and listen to Jesus tell parables. But that doesn't mean there aren't opportunities to learn the lessons He taught. When we read the Bible, are we just reading the words or are we really paying attention to them? Are we focused on them, mulling over what we're reading and thinking about how it can apply to our lives? When we read books (or online devotions 😉) about Christian living, are we busy thinking about how other people could benefit from reading those thoughts, or are we looking for ways to use the lessons to be better Christians ourselves? The same holds true for listening to sermons at church. Are we just marking time, letting our minds wander and waiting for the service to be over? Or are we actively listening, focusing on what we can take from what we are hearing? As is so often the case, this isn't a decide-once type of question. We don't decide today that we're going to focus and then never again find ourselves hearing the words without paying attention to the meaning. It's a choice we must make constantly, every time the opportunity to learn is presented to us. 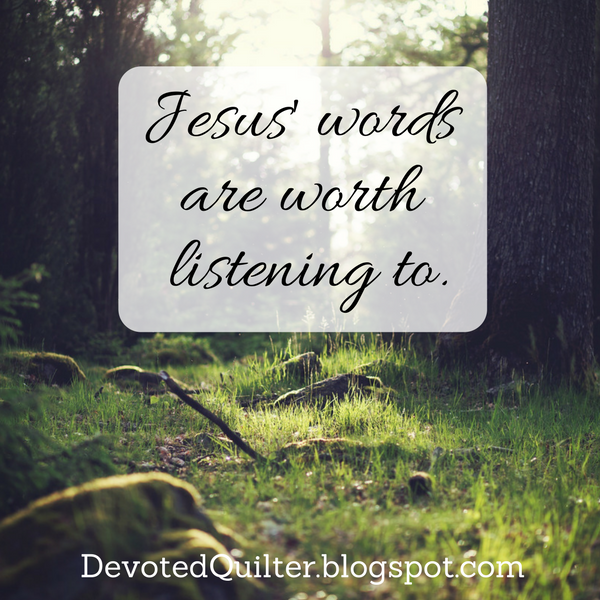 If you ask me, Jesus' words are worth listening to.